Why should we get excited about history? When I was at school I hated the subject so chose Geography instead, and the reason behind this is that, at school, I was taught history from a book. It was just words and drawings of what ‘might’ have happened in the past. As I grow older I realised that I was surrounded by visual history as I went about my walks. A walk through your local town or village will reveal a changing history probably going back 500 years from the old cottages and the church to the modern new builds. This is living history, it is around us all the time. The same is true when you are out walking in the countryside, though this can be on a much larger and older scale. The act of seeing and visiting an ancient monument is a chance to walk in the foot steps of our ancestors and immerse yourself in daydreams of life 3000 years ago. That to me is what history is all about – not the stuffy textbooks in a school classroom, but outside in the greatest classroom of all. Today we take a strenuous but pleasant walk along part of the South Downs Way close to South Harting in West Sussex. This is a very popular area with walkers, picnickers and para-gliders, but I doubt if more than a handful are aware of the history they are ‘playing in’. Route – A 6.3 mile linear round trip with 1671 feet of ascent. The Devil’s Jumps are a group of five large bell barrows situated on Treyford Hill. they are considered to be the best preserved Bronze Age barrow group in Sussex. Laid out in a line running approximately south-east to north-west. The five barrows vary in diameter from 26 to 34 metres and stand up to 4.8 metres high. Two smaller barrows were situated close to the five main mounds. Traces remain of a sixth barrow. A bell barrow, is sometimes referred to as a Wessex type barrow, campanulate form barrow, or a bermed barrow. They take the form of a circular mound within a circular ditch, the mounds being separated from the ditch and each other by a berm. There is sometimes present an additional bank, external to the ditch. The Devil’s Jumps have been dated to the Bronze Age and they are believed to be 3000 to 4000 years old. The main line of five barrows is aligned with sunset on Midsummer Day, although the nearby trees mean that the effect of the sun dipping below the horizon is less impressive today. On the walk to and from the Devil’s Jumps you will have walked over the dominant hill called Beacon or Harting Hill. Topped with an Ordnance Survey Trig Pillar, this is a fine view-point on a clear day with views down to the south coast and as far north as London. It is not surprising that the hill-top was enclosed as a hill fort during the Late Bronze Age between the 8th and 6th centuries BC. Then to be renewed later during the Late Iron Age. The hillfort is defined by a single rampart and a flat-bottomed ditch, which survives as a low bank up to 6 metres (20 ft) wide. The rampart was originally faced with timber, with timber palisades acting as retaining walls on both the inside and the outside. It is best preserved on the south side. The ramparts enclose an area 400m by 500m covering approximately 10 Ha with an entrance on the west side. This entrance was excavated and show evidence that a large timber gate was built within the entrance causeway. There is a possible second entrance where the footpath leaves the enclosure on the northeast side. It is believed that the cross dykes clearly visible on the adjacent Pen Hill are outlying defences associated with the hill fort. In addition to the Bronze Age remains, the area of the hill fort also includes an Anglo-Saxon burial mound, and the foundations of a late 18th century telegraph station. Looking due east, beyond Pen Hill, the occupants would have clearly seen the Bronze Age burials at Devil’s Jumps on the horizon reminding them of their ancestors. 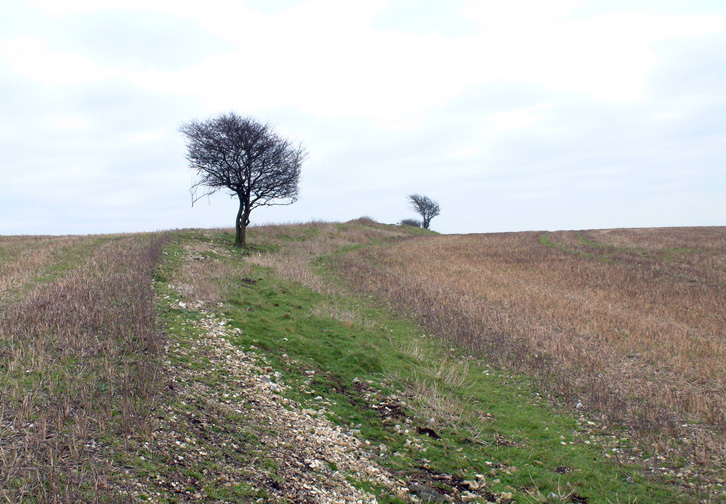 In Walks Through History – Part 3 we look at one of Hampshire’s great Iron Age hill forts, splendidly situated on the southern chalk ridge of the county and built on the site of a Bronze Age cemetery.